How can nonprofit leaders embrace digital innovation in their efforts to attract, develop, and retain top executive talent? It’s a question on many nonprofits’ (and executive recruiters’) minds. I recently spoke with the Association of Executive Search and Leadership Consultants (AESC) regarding the “Fourth Industrial Revolution” we’re currently experiencing and how it’s transforming the executive search process, for their report “Leading Transformation: Shaping the C-Suite for Business 4.0 Innovation” (click to read the report in full). Based upon my interview, I’ve outlined below various strategies nonprofit leaders may consider in their efforts to capitalize on digital innovation and attract and retain top talent. Everett Rogers created the “Diffusion of Innovations” theory which seeks to explain why and how new technology is spread. 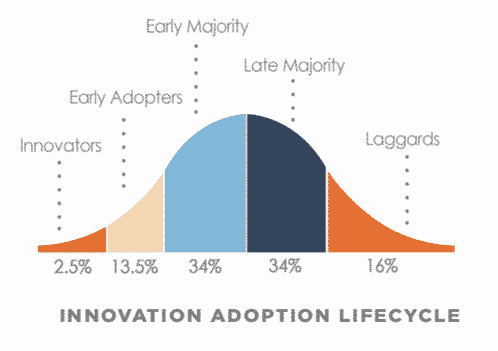 Rogers’ 1962 seminal work outlines five types of adopters: Innovators, Early Adopters, Early Majority, Late Majority, and Laggards, and remains relevant today. It’s best to be an Early Adopter, as this group can take advantage of the breakthroughs first created by the Innovators and reap many of the benefits (such as processes and products) without encountering as much risk. For example, video conferencing was a cutting-edge innovation 15 years ago, but most people didn’t know it was available or how to use it; 8-10 years ago, video conferencing became a competitive advantage for Early Adopter nonprofits; the Late Majority and Laggards are just now dialing in. By staying apprised of advancements within the field, nonprofits can adopt the forward-thinking technologies and strategies that will distinguish their organization and attract like-minded, innovative talent. Recruiting digital talent is a top priority for organizations of all sizes and kind around the world, but that’s easier said than done! However, there are key, untapped pools of digital talent that many nonprofits can take advantage of regardless of what stage they are in of the innovation adoption life cycle. For-Profit Talent is the most obvious digital talent pool, primarily in the areas of finance, human resources, marketing, and data analytics. While these potential hires may take time to adapt to a different infrastructure and expectations, they contribute to a large recruitment pool. Innovators within the nonprofit sector should not be overlooked. It’s important to note that the U.S. nonprofit industry is substantial in size—estimates range from 15-20% of the economy. Not surprisingly, within the large nonprofit sector already exists Innovators who are at the forefront of technological advances, such as online learning, virtual after-school teacher training, and global advocacy groups’ distributed work force communication and supervision. Take note of the talent already within the industry – why not target them? Board and volunteer members can be a built-in, technology-savvy pool. Nonprofit organizations should consider prioritizing a knowledge of and appreciation for technological innovation when recruiting new board and/or volunteer members. These valuable contributors could also create a fertile pipeline for future hires or referrals. To successfully hire innovative talent, nonprofit hiring managers might need to adjust their candidate expectations. For instance, ambitious digital Innovators are often comfortable jumping from one high-risk enterprise to another in search of the opportunity to significantly contribute to a scaled ramp-up. Hiring managers must recognize the higher likelihood or short-term stays among this group and manage expectations accordingly. Additionally, for all mid-level and c-suite searches, nonprofits should be sure that their finalists for the position include several tech-savvy candidates. The nonprofit will benefit from their invaluable expertise and, if nothing else, create a valuable pipeline for future hires. By keeping abreast of technological innovations in the industry, nonprofit organizations better their chances of finding and retaining top talent and growing as an organization. To learn more about embracing this digital revolution, read the AESC report or check out the resources provided by our client, the Clayton Christensen Institute, a think tank dedicated to disruptive innovation. Development Guild DDI is a nonprofit leadership development consulting firm that provides executive search, fundraising counsel, and campaign services. Please contact Bill to learn more about our executive search services. Discover how our current search client, University of the People, is offering a tuition-free education to students worldwide! Our Senior Vice President Tracy Marshall shares the do’s and don’ts of interacting with executive recruiters. For the latest edition of our Featured Placements series, we spoke with Reva Feinstein, who we placed at the Columbia University School of Nursing over 10 years ago. Sign up for our newsletter to receive periodic updates about client news, open positions, and recently placed candidates. If you submit your résumé, we will consider it for open positions. Copyright © 2019 Development Guild DDI, Inc.